In the first video, we are going to organize data with a matrix. Matrix: A rectangular array of data such as numbers and symbols. Let’s look at organizing data with matrices. First, let’s go over what matrix is. Matrix is an array of data. Here, we have three rows and two columns. Let’s look at the data again. its dimension or row and column. Let’s label the rows and columns. In the second video, we are going to add and subtract data with a matrix. To do so, we can simply either add or subtract the values in the corresponding locations in the given matrices. Note that only matrices of the same size can be added or subtracted. Let’s go over adding and subtracting matrices. We’re just going to subtract elements that are on the corresponding positions. Now, let’s have this matrix. Three rows and two columns. Plus this other . So, our answer will be three rows and two columns. Again, we’re just going to add corresponding elements. What elements correspond to each other? Which ones are we going to add together? It’s difficult because one has a third row and the other doesn’t. In this case, there is no match up. So, there is no solution. For addition and subtraction, the size or the dimension of the matrices have to be the same. In the third video, we are going to multiply a matrix by a scalar. We can simply multiply the scalar number by each value inside the matrix. Let’s go over multiplying a matrix by a scalar. Here we have a matrix to be multiplied by . If we multiply this matrix by a scalar which is , our answer is going to be also . So, let’s just multiply each element by . Here, we have a scalar quantity and a two-row by three-column matrix. When we multiply them, we’ll also end up with a two-row by a three-column matrix. And just multiply each element by . In multiplying a matrix by a scalar, we just have to multiply each element by that scalar quantity. In the fourth video, we are going to multiply a matrix with a matrix. 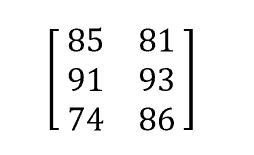 If the matrices have different sizes, multiply the corresponding numbers but of different orientations. Since the first matrix is 2×3 and the second matrix is 3×2, your answer is a 2×2 matrix. To get the value of , multiply each number of the first row in the first matrix by the corresponding number in the first column of the second matrix, and add the products (Ex:2×5+6×4+1×6). To get the value of , multiply each number of the first row in the first matrix by the corresponding number in the second column of the second matrix, and add the products. To get the value of , multiply each number of the second row in the first matrix by the corresponding number in the first column of the second matrix, and add the products. To get the value of , multiply each number of the second row in the first matrix by the corresponding number in the second column of the second matrix, and add the products. Let’s go over multiplying a matrix by a matrix. First thing I want to point out is that not all matrices can be multiplied together. Here, one matrix has two rows by three columns and the other one has three rows by two columns. These two can be multiplied together. You have check if the number of columns in the first matrix is the same as the number of rows in the second matrix. So, yes, these can be multiplied together. The result is what we’re left with. So, our answer will be a two by two matrix. Multiplying matrix is a little bit complicated. First, let’s draw four spots or lines inside the matrix. Then label them as , , , and . These labels represent the row and column. To get what goes in each spot, we’re going to multiply the first row of the first matrix by the first column of the second matrix. We’re going to multiply the corresponding elements together. Now, we’re on the second row by first column. We’re going to multiply the second row of the first matrix by the first column of the second matrix. In the second row by second column element, let’s multiply the second row of the first matrix by the second column of the second matrix. A two by three matrix multiplied by three by two matrix gives us a two by two matrix. Here, we have a two by one matrix multiplied by a two by two matrix. Now, let’s look if the number of columns in the first matrix will match the number of rows in the second matrix. First, the matrix has one column and the second matrix has two rows which don’t match up. So, this one has no solution. We can’t multiply them together. First matrix has three rows by one column. The second matrix has one row by two columns. The number of columns in the first matrix match the number of rows in the second matrix. So, we can multiply these two. And we’re going to end up with three by two matrix. To solve, draw six spots or lines which will represent each element’s dimension. Multiplying a three by one matrix by one by two matrix resulted in a three by two matrix.